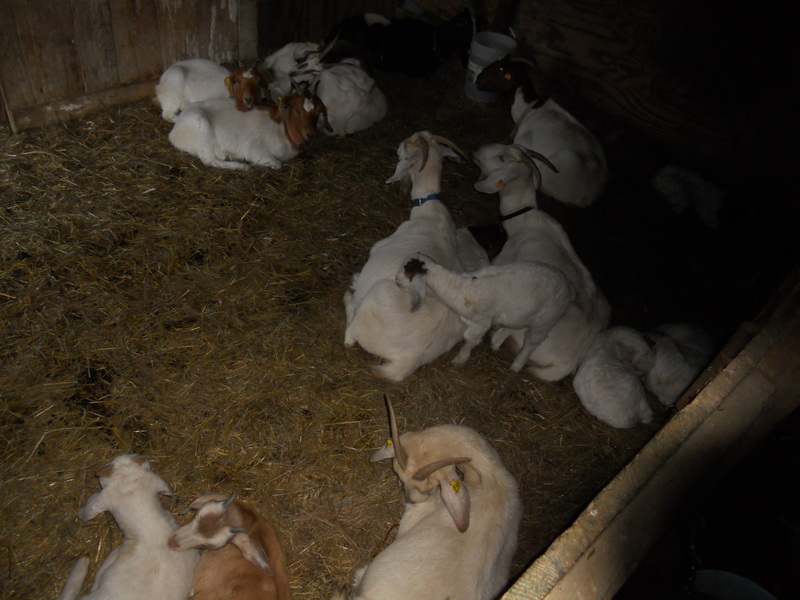 In a small flock, goats show very distinct personalities: bossy, playful, calm, determined. They’re all important to me, but Trillium #168 has a special status. She came here as an additional milker, from Windhover Farm where, last January, she lost a set of triplets. (The first presented breech, and before it could be turned, the placenta had separated). So as her kidding date approached, I watched her closely. After false labor, Trill's impatient to be back out with the flock. When she didn’t develop active contractions, and seemed nervous away from the herd, I turned her back out. That was a lovely evening, when the flock “slept out,” tiny kids included, on high dry ground in their pasture. The next day she passed a little mucus: good indication that delivery is still a few days off. So, Tuesday was false labor, or maybe just a kid moving into position. Here thanks are in order to Leslie and Larry, for a.) calming me down and coaxing me to trust Nature a bit, and b.) solid advice about what to look for and to do. Calmly browsing, the day after her "due date." Somehow, yesterday afternoon, she looked different. 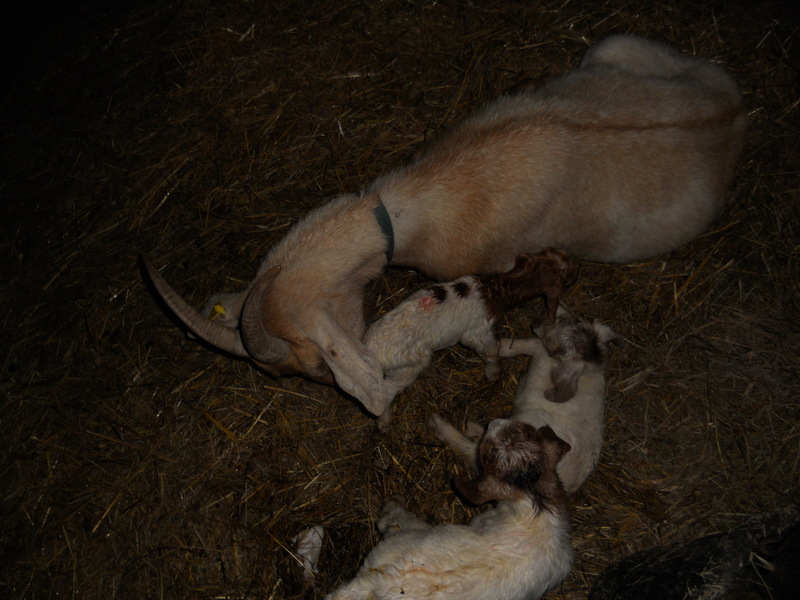 For one thing (pay attention, anyone who might want goats in their future), altho her udder was well-developed Tuesday, by Friday it had taken on a tight, shiny surface. In some does, that’s a reliable sign. At feeding time Trill was pawing! I had to go get the cake out of the oven (bad timing Nan! ), then come back to sit in the stall. Sure enough, within minutes, she arched her back with a strong contraction. Three more came ten minutes apart. But she was standing up – not good body mechanics when a kid has to move from the lower abdomen up into the birth canal. I encouraged her to lie down, and she took the hint. The next few minutes were really anxious. Does are pretty stoical, and 3 of mine kid without a sound. Aggie and Edie paw 3 times, bear down twice and drop twins. 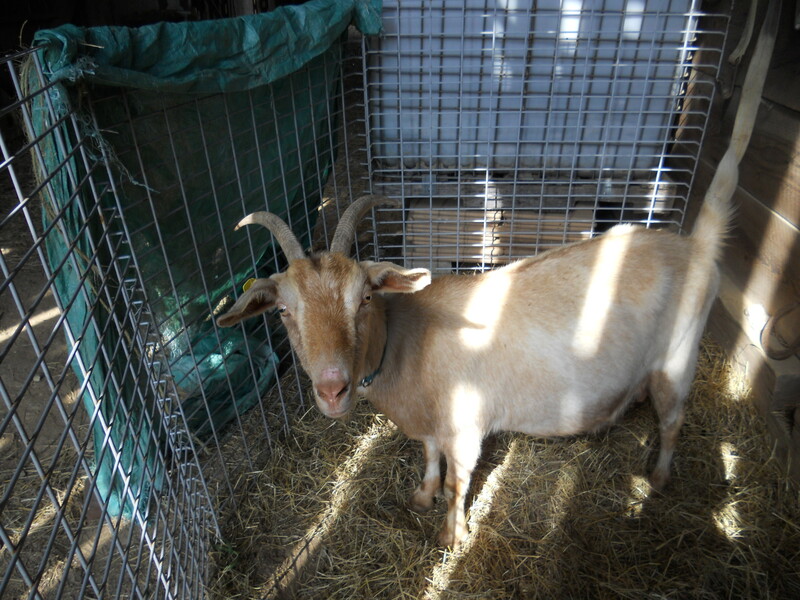 But Trill, the quietest of my goats, whose normal bleat is a faint, gravelly treble, absolutely bellowed with each push. This caused me no end of concern: was the first kid breech? (No reason to assume this just from the history) Had the cervix not dilated (as it definitely hadn’t Tuesday!)? Was something else seriously wrong? Bless her heart, she lay still to let me check: an effaced cervix, and just beyond, a bubble of amniotic sac and fluid. That meant, most likely, a nose and feet. (When the tail is first, it’s almost impossible for anything to get into the birth canal) Well, foot. Two more dramatic pushes, and a head and one hoof appeared. Eek. She was straining so hard, I could not imagine trying to push against her, to get the kid back in and reposition it. So I let her push, easing the opening, and the kid was out: a big leggy doe. She started cleaning it, gave another couple grunts and shoves, and the second, a good-sized buck, presenting correctly, slid out. 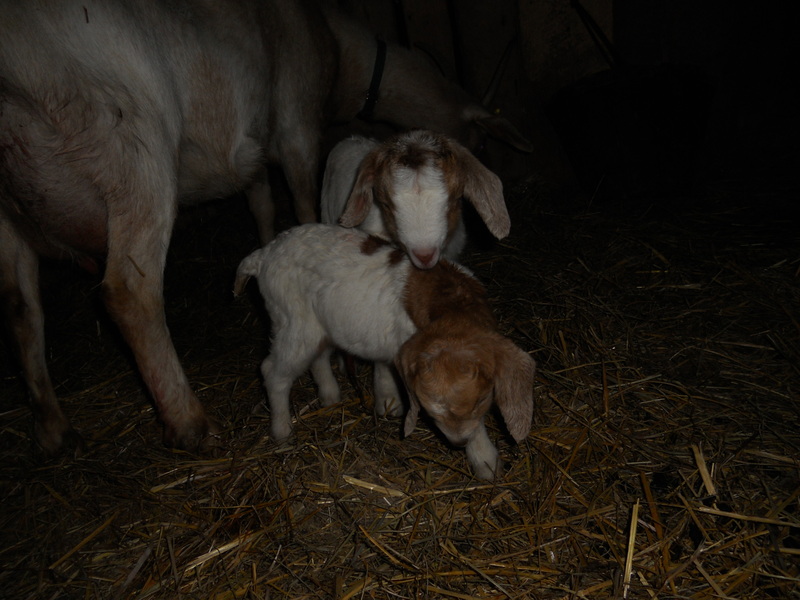 Next she was on her feet, cleaning both of them and nudging them to stand and nurse. But to my astonishment, she tried to kick one out of the way! No, she was pawing again, laid down, gave a couple more pushes and delivered a tiny doe kid. "Cute?" asked a text message. "Not quite yet: slimy & squalling, like all young!" I suppose they make these blog things with audio add-ons? Silent Trill’s three kids had the shrillest, loudest, most persistent cries of any I have been around. On my way to the house to get tonic, I could still hear them: sounded like a cat fight. In a fine show of sympathy, the other does trooped off down the hill to get away from the noise, and stayed till after dark. Sorry, no pictures of actual delivery: no extra hand to hold the camera. These were taken between helping dry all 3 and setting them where they could nurse. 11 PM: The flock peacefully share the outer stall, after Trill's 3 quiet down. Saturday, 7AM - Okay, NOW they're cute! Monday update: No way will I let her go thru what Jonquil did, owing to my inexperience. After 2 weeks of nursing three, she was, in the idiom, “pore as a snake.” When one was sold, the others got some growth, and she has filled out, especially since the pasture greened up. The plan for Trill is to keep her in at least a week, on extra rations, and have her in good flesh to begin. Once this cold spell (promoted from “cold snap” yesterday AM) ends and she’s turned out, the grass, honeysuckle and early weeds will be far enough along to maintain her milk supply without depleting her. For right now, speaking of milk supplies, she seems to have enough for quadruplets. Apparently all 3 kids had been nursing one teat, as the other was so engorged they had trouble grasping it. I have had to milk her out a little to get her comfortable enough to lie down. That won’t last, however: they are active and curious (we let them out in the sunshine briefly yesterday) (Trill didn’t want to go back in) and will soon be taking every drop she produces. So we’ll wait, contentedly, till around July for her rich sweet milk. If Jonquil seems inclined to wean hers, we’ll see how she milks. 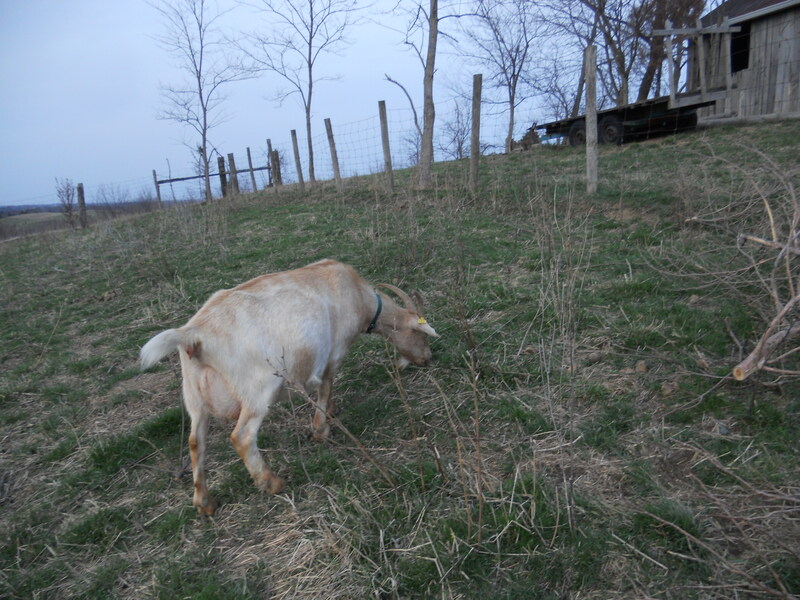 One more doe to kid – Nightshade, the black Alpine, my prize milker, who isn’t due till late April-May. Fantastic narrative!–I could almost hear the bleats–of course I did have the advantage of your audio on the phone! And they are cute! Yup, that was them (they?) in the background. For the benefit of other readers, “the aliens” are my sister Mary and her husband Dan, who years ago retired from relatively staid occupations (nursing, school administration) and took up carpentry, fiber arts, horticulture, travel… Upon hearing some of these plans, their offspring concluded they’d been kidnapped by aliens and replaced with inaccurate, tho lifelike, facsimiles. They are among Shady Grove Farm’s most staunch supporters and enthusiasts: on top of which, they grasp the humor/relish the ironies of many aspects of my life.